‘Na granicy percepcji rosną wspaniałe kwiaty’ (‘on the border of perception grow amazing flowers’) is the title and research topic for the #54 edition of PAS | Performance Art Studies in Łódź, Poland. The project is part of the ‘Rok Awangardy’ (year of avant-garde) at the art academy in Łódź and consists of three parts: a PAS studies, an exhibition, and a performance art event. To perceive is an action, something that we actively do, but not always consciously. 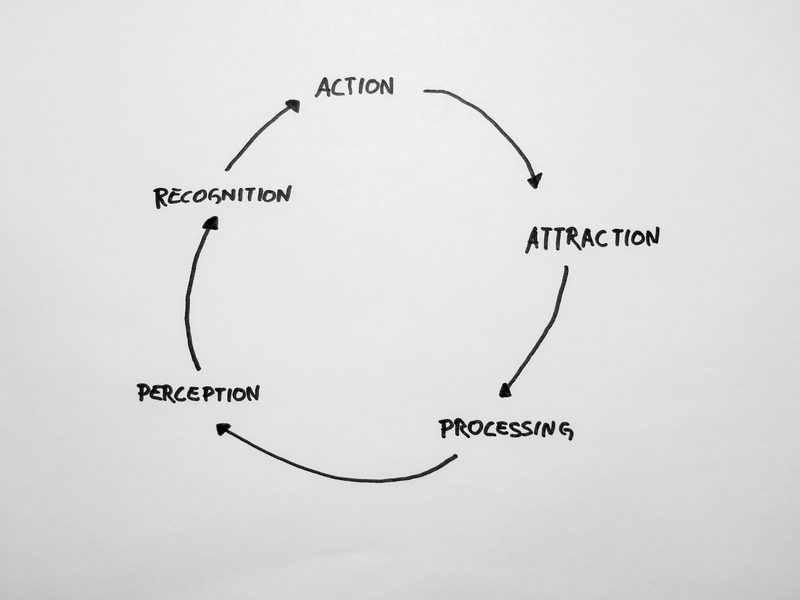 Perception is following a chain of activities which are bound together: Action - Attraction - Processing - Perception - Recognition - Action and so on. This chain is essential for the organization, identification, and interpretation of sensory information and is needed to understand our environment, society, and personality. Within the arts, perception is a tool used to confuse, deconstruct or disturb, in order, to relate differently to ourselves, the society, and the environment. Artists of all genres are interested in toying around with the chain of perception. Op-Art, Surrealism, Dadaism, and of course, Performance Art are some examples, of how aesthetic or visual perception offers a diverse view on the world, which provides an opportunity to question how we perceive, since the perception-chain is individual and does not have a collective function. This fact becomes potentially interesting when two (or more) perceptions meet. The exchange of experience creates a dialogue and intersection, which acts as the base for our daily communication. Sharing these experiences offers us the possibility to rethink paradigms, question single viewpoints, and better understand the need for change. The deeper we inquire within the field of perception we holistically find ourselves straddling the borders of logic, sense, and understanding. In these perhaps, uncanny areas, one could potentially become capable of locating and acknowledging these blossoming flowers of art. The aim, of PAS #54 focuses on the concept of perception as a prompt and/or launching point for better understanding the body, space, time, material, and action as active tools of Performance Art. Researchers will engage with other art forms, such as poetry, sculpture, drawing, painting, video, architecture, with the intent of demonstrating context in relation to time relevant issues. Results and findings will take form and shall be presented upon completing theoretical analysis. As part of the studies, we will create an excursion for the INTERAKCJE performance festival in Piotryków Trybunalski and participate in this year’s exhibition as a group performance. Extending the research topic of PAS #54, we will present an exhibition at Galeria Kobro in Łódź with photographs, process documentation, video performance, and video documentations of previous PAS projects. This opportunity to present on a large scale, debuts PAS, alongside the photographic documentation of PAS photographers, Matthias Pick and Monika Sobczak. Performance work of numerous young international artists will display a ‘new generation’ of performance artists, who are entering and reinterpreting the vast field of Performance Art. The exhibition will also include THE WALL, which consists of process documentation from several past studies, which entices the audience to dive deep into making and thinking of performance practice and theory. Drawings, notes, citations, thoughts, texts will be included and presented on hundreds of sheets, making up a wall of thoughts. Finally, the exhibition will include video documentation, as well as a documentary film ‘Sharpen One’s View’, by Matthias Pick. At the opening of the exhibition on Friday 12th May 2017 (19:00) BBB Johannes Deimling will present a new work of his performance cycle ‘It, won’t always grow back’. As part of the national ‘museum’s night’, in Poland, we will present an evening of performance art with four polish artists: Weronika Lewandowska (Warsaw), Łukasz Trusewicz (Poznań), Vena Naskręcka (Częstochowa), Konrad Juściński (Poznań). The four performances will respond to the previously conducted research of the studies and exhibition, while simultaneously interpreting the topic of perception. Agnieszka Szabilkowska-Trusewicz (Galeria Raczej, Poznań) will give an introduction and guide through the evening.